Bancroft Tower - You are not forgotten. 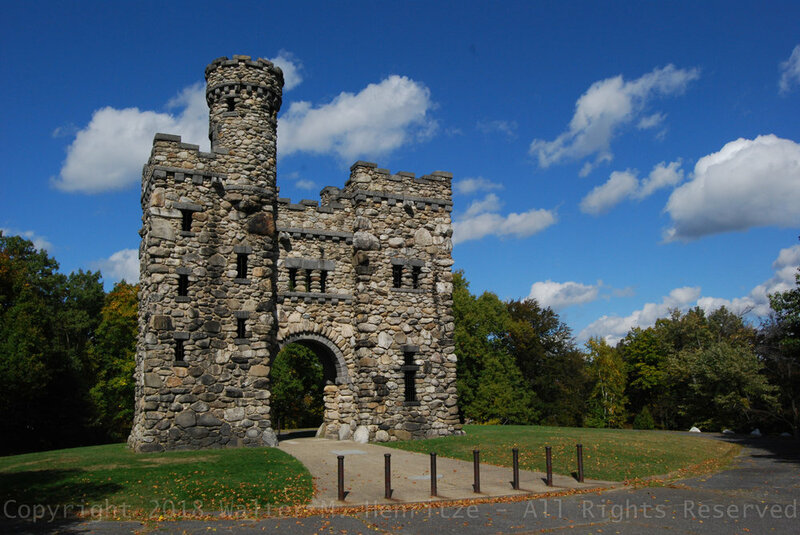 Bancroft Tower is the only remaining example of three similar structures that once stood in the city of Worcester. It's construction was funded by Stephen Salisbury III to honor the memory of George Bancroft who, among a host of other accomplishments, created the United States Naval Academy at Annapolis during his tenure as the U.S. Secretary of Navy. Designed by the local firm of Earle & Fisher, the tower was completed in 1900 at a cost of $15,000 and is now the centerpiece of Salisbury Park. You are not forgotten. I am very busy & too tired to write much. Picked 24 1/2 qts. blueberries to-day. Earned $2.94 to-day. Not much compared to your strawberry crop. We have to bring all our water. It is very dry, even berries which suffer the least will not last long if rain does not come soon. It probably will as God usually provides all. I don't feel very good to-night Give my love to both families. Ethel C.
I'm too tired to write as I ought. 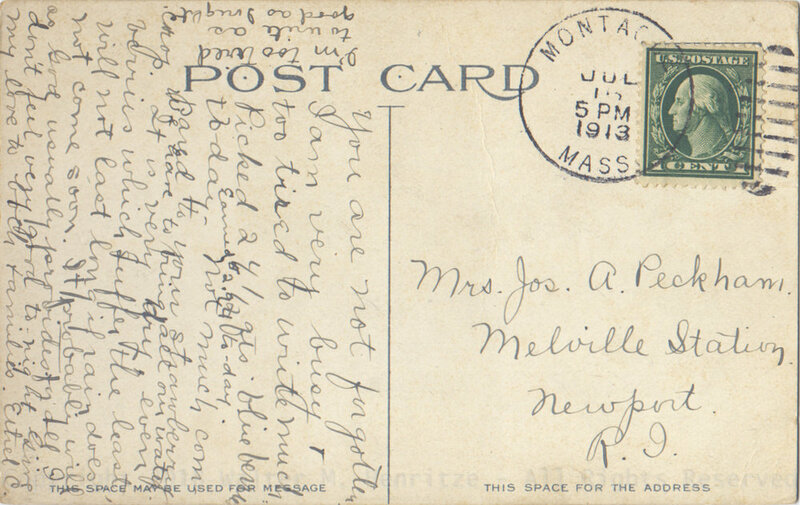 The message on this card is not so much a mystery as it is a startling view into one rural laborer's life during the early 1900's. At the time, Ethel was working on a farm in Montague, Massachusetts earning 12 cents per quart of blueberries picked. Today, on an inflation adjusted basis, that would be about $3.02 per quart, or $74 for her day's work. She is clearly exhausted and not feeling well. And no wonder!! In the middle of a hot, dry July, she probably worked 10 - 12 hours per day for six days a week. The absence of the sender's surname on this card leaves her history relatively immune to research. However, she and the recipient clearly have a close relationship and the pain of her separation from "both families" is evident from the first sentence. Ella Remembrance (Farnum) Peckham (Mrs. Jos. A. Peckham) was born in Peru, Vermont in 1879 and was married there in 1899. At the time of the 1910 federal census, she was living on a farm in Middletown, Newport, Rhode Island with her husband and three children. She died in 1969 and is buried beside her husband in the Middletown Cemetery. Identity of printer/distributor not shown on the card.